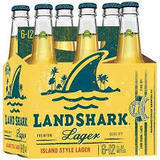 Brewed in Jacksonville for Margaritaville Brewing Co. Refreshing, drinkable island lager. Found in 4.7% and 4.0% variants.